Product #15645 | SKU MB_SPCX-E-BM1 | 0.0 (no ratings yet) Thanks for your rating! 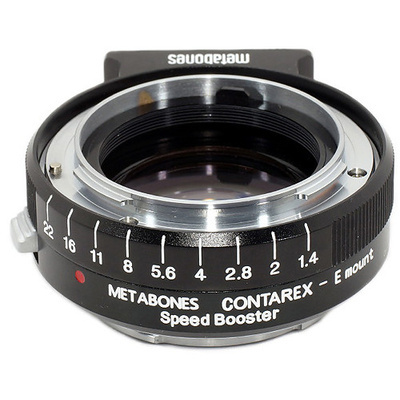 The Contarex Lens to Sony NEX Camera Speed Booster from Metabones allows Contarex lenses to be mounted to Sony E-Mount APS-C format cameras, increasing the angle of view and the maximum aperture of the lens by 1 f-stop. This photo accessory also comes with a detachable tripod foot that is compatible with Arca Swiss, Markins, and Photo Clam ball heads. These speed boosters are only fully compatible with mirrorless cameras housing APS-C or smaller image sensors. They will physically fit the Sony A7/A7R full frame mirrorless cameras but the camera must be set in Crop Mode to fully support the speed booster's functions.